2017 brought new novels by Elliot Ackerman, David Abrams, Helen Benedict, and Siobhan Fallon, and new poetry volumes by Jehanne Dubrow and Elyse Fenton. Also arriving was a first novel by contemporary war short-fiction pioneer Brian Van Reet. By any measure, that’s a bumper crop of new contemporary war fiction and poetry by veteran mil-and-war authors. Besides these works, though, releases of novels, short story collections, and volumes of poetry by major publishing houses were in short supply. Fortunately, university, regional, and independent presses picked up some of the slack: Caleb Cage’s short-story collection Desert Mementos: Stories of Iraq and Nevada appeared courtesy of University of Nevada Press, Eric Chandler’s poetry collection Hugging This Rock was published by Charlie Sherpa’s Middle West Press, and Samuel Gonzalez, Jr. and Christopher Meeks self-published their very interesting novel The Chords of War. Fallon’s The Confusion of Languages and Ackerman’s Dark at the Crossing only indirectly reference Iraq and Afghanistan, but the locale of each book—Jordan and Turkey, respectively—their interest in conflict and empire, and their authors’ formidable reputations as military insiders validates their inclusion on this year’s list. Other renown war-writers, such as Brian Castner and Roy Scranton, have begun to craft literary identities and build publishing histories well-beyond the confining limits of war literature, a trend that will certainly intensify in coming years. Ackerman’s Dark at the Crossing earned National Book Award short-list honors, and Van Reet’s Spoils made The Guardian and Wall Street Journal’s year-end “best of” lists. Despite such laurels, war writing as a genre seems to have fallen from major media favor—we’re far from the 2014 days when Vanity Fair and the New York Times ran fawning author portraits and glowing genre appraisals. Online writing by veteran writers has fortunately continued vibrantly apace on websites such as The War Horse, Military Experience and the Arts, The Wrath-Bearing Tree, 0-Dark-Thirty, and War, Literature, and the Arts–and thank you very much all concerned. Our Trojan War, a modern-war/Homeric-war hybrid, and Jay Moad’s one-man-play Outside Paducah were the highlights of the year in terms of theatrical productions related to Iraq and Afghanistan staged in New York City, but elsewhere in-and-out of NYC the year saw no big-name, big-cast, big-money productions that garnered national attention. There was, however, plenty of action at the regional, local, DIY, collective, performance art, and spoken-word level. Toward the end of the year, former Marine and current movie star Adam Driver announced a $10,000 prize to the winner of a veterans playwriting competition, encouraging news for the energetic talent in the grassroots theater scene. The only major motion picture released in 2017 about war in Iraq or Afghanistan that a caused much of a splash was War Machine, a Netflix TV-release starring Brad Pitt that I am including here by exception. American Sniper writer Jason Hall’s directorial debut Thank You For Your Service (based on David Finkel’s book) and Richard Linklater’ Last Flag Flying came-and-went quickly. Art and photography exhibition choices offered slim pickings, too, though I’m happy to report Bill Putnam’s photography–oft on display on Time Now–was featured at exhibits in Washington, DC, and New York this year. 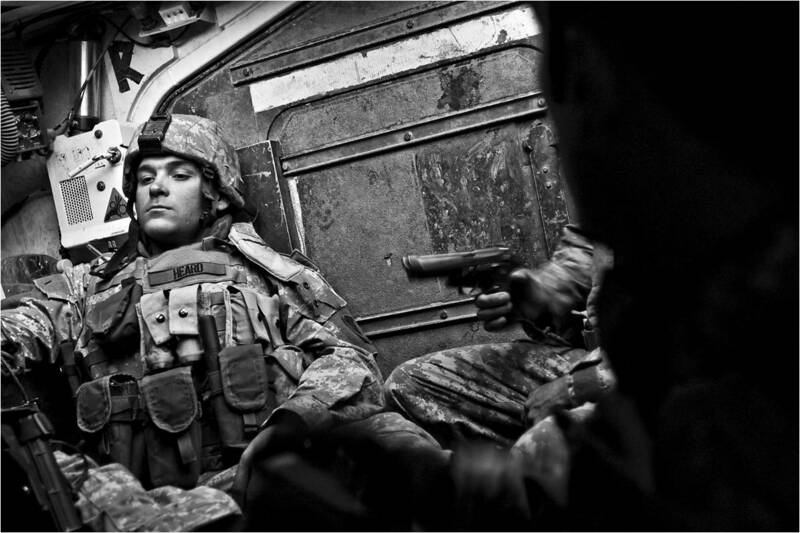 In 2016, I included a list of notable non-fiction works about war in Iraq and Afghanistan, but, as with Hollywood movies and the art-and-photo scene, the genre seems to have dried up. I’ve long since stopped tracking veteran memoirs closely, but a Military Times list of year’s best military books offers a couple of titles worth checking out. The poetry list includes many new entries cribbed from Charlie Sherpa’s Mother of All 21st Century War Poetry Lists, which observes these things far better than I do–many thanks. Please notify me of any errors or omissions, and I’ll correct the record. Tom King and Mitch Gervais, The Sheriff of Babylon, vol 1: Bang. Bang. Bang. (2016). 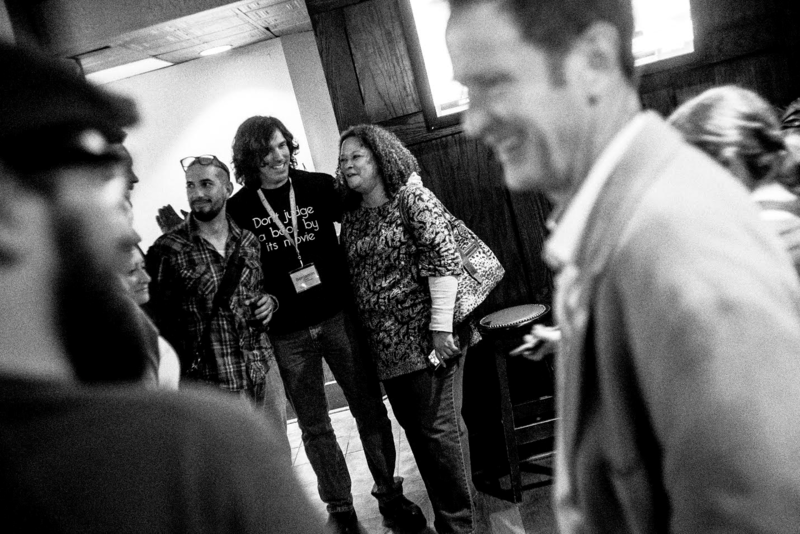 Matthew Hefti, Benjamin Busch, and Mary Doyle at AWP17, with a glimpse of Teresa Fazio in the left foreground and Whitney Terrell on the right. Photo by Bill Putnam. This entry was posted on December 15, 2017 at 6:40 pm and is filed under Art and War. You can subscribe via RSS 2.0 feed to this post's comments. Thanks as always for putting these lists together. Not sure if you’d call it a “major” motion picture (the release was somewhat limited) but THE WALL came out from Amazon Studios. It is set in Iraq. I am primed to dislike movies about snipers, but I found myself liking this one – more of a bleak, psychological action-thriller than a strictly realistic war movie. Good twist ending that also functions as a pretty apt allegory for our ongoing stupidity in the Middle East. Worth a watch, anyway. Also, THE YELLOW BIRDS premiered at Sundance this winter. Haven’t heard when/if it will be released. Thanks, Brian–always honored to hear from you! I just reread Spoils and marveled at the perceptiveness of its portrait of loyalty among fighting men and women, on both sides. No one on either side is a “true believer” or model soldier, or even in agreement about what those things might entail. I also liked the way Cassandra measured the virtues and limitations of Crump and McGinness, and Sleed those of Galvan and Rooster. Thanks for the tip on The Wall, I’ll add it to the list and check it out. For some reason, it makes me think of The Objective, a 2008 film made by The Blair Witch Project director Daniel Myrick about special operators in Afghanistan, for which I have a soft spot. Thanks also for the tip on The Yellow Birds, and let’s also not forget to mention Kevin Powers’ next novel A Shout in the Ruins will be out in 2018. Not about Iraq or Afghanistan, but Virginia, which as a Virginian myself interests me very much.